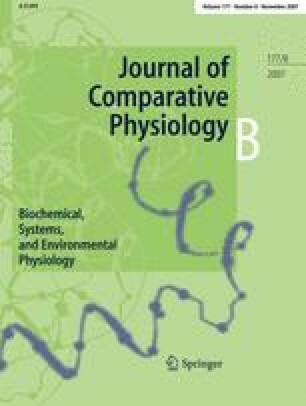 This study gives an integrated analysis of the effects of temperature, swimming speed and body mass on standard metabolism and aerobic swimming performance in vendace (Coregonus albula (L.)). The metabolic rate was investigated at 4, 8 and 15°C using one flow-through respirometer and two intermittent-flow swim tunnels. We found that the standard metabolic rate (SMR), which increased significantly with temperature, accounted for up to 2/3 of the total swimming costs at optimum speed (U opt), although mean U opt was high, ranging from 2.0 to 2.8 body lengths per second. Net swimming costs increased with swimming speed, but showed no clear trend with temperature. The influence of body mass on the metabolic rate varied with temperature and activity level resulting in scaling exponents (b) of 0.71–0.94. A multivariate regression analysis was performed to integrate the effects of temperature, speed and mass (AMR = 0.82M 0.93 exp(0.07T) + 0.43M 0.93 U 2.03). The regression analysis showed that temperature affects standard but not net active metabolic costs in this species. Further, we conclude that a low speed exponent, high optimum speeds and high ratios of standard to activity costs suggest a remarkably efficient swimming performance in vendace. The authors wish to thank Thomas Mehner and two anonymous referees for helpful comments on an earlier draft of the manuscript. The experiments comply with the German Guidelines for Animal Care.